What interior design trends will we see in 2018? Mid-century modern is still popular, but the look is softening, well illustrated in this clear acrylic table base that gives the emerald top a floating illusion. The modern drum shade on the ceiling fixture is wrapped in a more traditional cage, juxtaposing two worlds into one cohesive look. 2018 is an exciting year for color, finally moving away from the long-lasting, monochromatic trend that has dominated the market for too long. People are craving the vitality that color brings to a space, and are eager to opt for bolder choices in fabric hues and furniture finishes. Blues and greens continue to dominate in coastal areas like ours, with navy blue and emerald green becoming the local favorite. And it’s easy to see why—it’s energetic and rich, bringing an air of sophistication and a prosperous vibe to any home. Most blues and greens mix well with botanical and animal prints and compliment outside environments, especially seaside. There is an increased attention to detailing with accents like trims, carvings, nail heads, beading and inlays. Acrylics have juxtaposed modern and vintage, showing up everywhere from console tables to bed frames. There is also a movement towards a more feminine sensibility. While Mid-century modern still maintains a stronghold in design, it is taking a more glamorous turn; lines are softening and curves are making their way into both furniture and upholstery. Texture is back and layers are in. Plush and fur fabrics were flaunted at High Point Market this year and tufting is still going strong. The velvet trend has transitioned from the fashion world into every room of the home, keeping with the luxurious, indulgent feel. Opulence is the continued trend, with a focus on the practicality of a durable, livable product. The market has responded with furniture pieces and fabrics with vibrant colors, weaves, and surfaces that are able to withstand the daily wear of and active lifestyle with kids, pets, and the occasional glass of wine! I’m also seeing an eagerness to invest in quality, and sustainability. More than ever, clients are requesting hand-crafted and “small batch” American-made pieces. This is exciting and encouraging, because it allows us to design a truly unique and personal space, while respecting and recognizing the true artistry of the American furniture makers. There is also a shift toward natural woods. Grey and driftwood tones will still maintain popularity in our area’s homes, but classic browns are definitely making a comeback. Inlays and live-edged woods are shifting into transitional designs, keeping with the movement towards craftsmanship and higher quality. Metals continue to play a strong role, with the exception of rose gold, which has gone out almost as quickly as it came in. Harmonizing silver and gold finishes in the same room has been embraced by most designers —some doing it better than others. Balancing tone and texture of colors and shades still needs to be cohesive, and it takes a discerning touch to ensure the look is balanced and aesthetically pleasing. Brass, nickel, copper, gold, and silver—have fun with them! Wallpaper is back and stronger than ever—but this isn’t your grandmother’s wallpaper! Large scale florals, geometrics, and landscapes in varying palettes continue to dominate. And if you’re hesitant to cover an entire wall, modernized chinoiserie and chintz can be used as art. Framed with beautiful moldings, these art-like panels add texture and depth to a room. Attention to detail and layered textures are huge trends for 2018 and beyond. 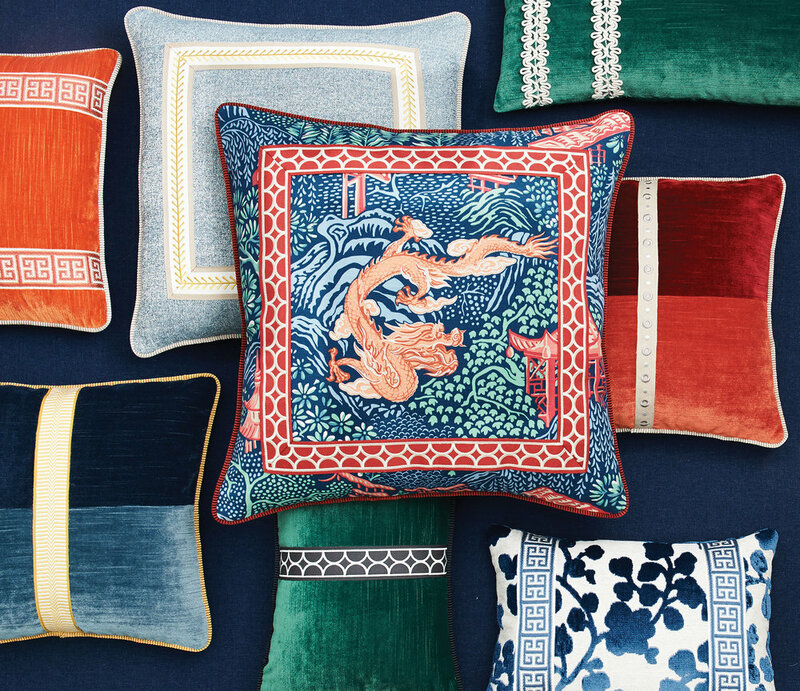 These pillows showcase how classic trim and embroidery can take on a modern feel. The femininity and beauty of chinoiserie is back! If you aren’t ready to commit to a whole wall of wallpaper, use decorative moldings to create frames to display the wallpaper like art. Retro is big—people are looking to old Hollywood for inspiration as shown in this Palm Springs feel bedding and headboard combo in vivid emerald green paired with natural tone animal prints.